Kris Miller from Spruce Ridge Studios: Are You A Copy Cat? By now, you have probably heard the turmoil going on in the needlework world about the illegal downloading of artwork and charts. If you haven't, I will refer you to Lori Brechlin's blog to read more about it, since she explains it so well. I do not normally get up on my soap box on my blog, but I find this trend of copying quite disturbing. So I'd like to address something that is going on in the rug hooking world as well. Yes, that's right. Did you know that when you purchase a pattern that is already drawn out on foundation cloth, you CAN NOT copy or retrace another one of that pattern? Not for your own use, not for your friend's use. If you want to have two copies of a particular pattern, you need to BUY two patterns. It is not my rule, it is COPYRIGHT LAW. It has been brought to my attention that certain guilds, groups, and even individuals will purchase a pattern or catalog of patterns, and then redraw a pattern again and again to share. This is illegal and it is stealing! So many people say, "well, it won't matter, I'm just doing it for myself and no one will find out." How would you feel if, on payday, part of your check was missing, or your paycheck was stolen? Pretty outrageous, right? That's exactly what happens when you copy another designer's work without paying for it. Many designers (myself included) are self-employed and depend on the sale of patterns to help pay the bills and buy groceries. When you copy a pattern, you are virtually denying them the sale of a pattern....another words, stealing from that person. You wouldn't take $40.00 out of my purse, would you? Then why would you copy my pattern? In my eyes, it's the same thing. You can make a difference by becoming the solution and not the problem! 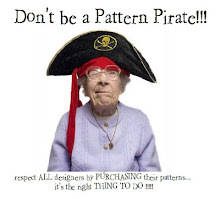 If you know someone who is copying patterns, let them know it is wrong (or let me know!). Do not involve yourself with guilds and groups who routinely copy other's works. Educate and inform individuals who don't know the "rules." Thanks Kris for posting about this! Great talking with you, and see you at Ghoultide! Copyright laws are so confusing, but this one is so basic it boggles my mind! Why would anyone think that a pattern sharing website would be okay to do?!?! I'm glad you brought this up Kris. There is WAY too much of this going on! I don't know how people can sleep at night knowing that they are stealing. I'm glad to see that you brought this up Kris. There is WAY too much of this going on. I don't know how people can sleep at night knowing that they are stealing.